The GPU is now just a computer case. IK Multimedia has released a range of accessories for its StompIO system, all of which are designed to aid the guitarist who wants to use it on stage. The most interesting of these is the GPU Stage Case - a metal enclosure into which you can put a mini PC or Mac mini. Load this up with AmpliTube software, hook it up to your StompIO and you've got a complete guitar tone generation setup. We saw a prototype version of the GPU at the 2008 Winter NAMM show. At this stage, the assumption was that it would actually contain a computer, but IK's decision to produce a case-only product suggests that it didn't think this would work commercially. The GPU Stage Case is available now priced at $130/€100/£94. The new accessories range also contains the Double Switch pedal, which retails for $80/€60 (an expression pedal was already available) and a gig bag. This costs $100/€75/£56. 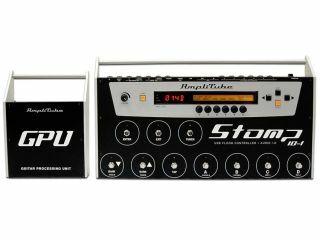 If you want to create the ultimate StompIO rig, you can also invest in the Tour Rack - a rolling case that gives you space for a 17-inch rackmount LCD screen, a rackmount computer, a power amp and other rack gear. No price has been announced for this one, which leads MusicRadar to suspect that it's probably rather expensive. Check out the IK Multimedia website for more.